The core organizational principle is “one worker, one vote”. 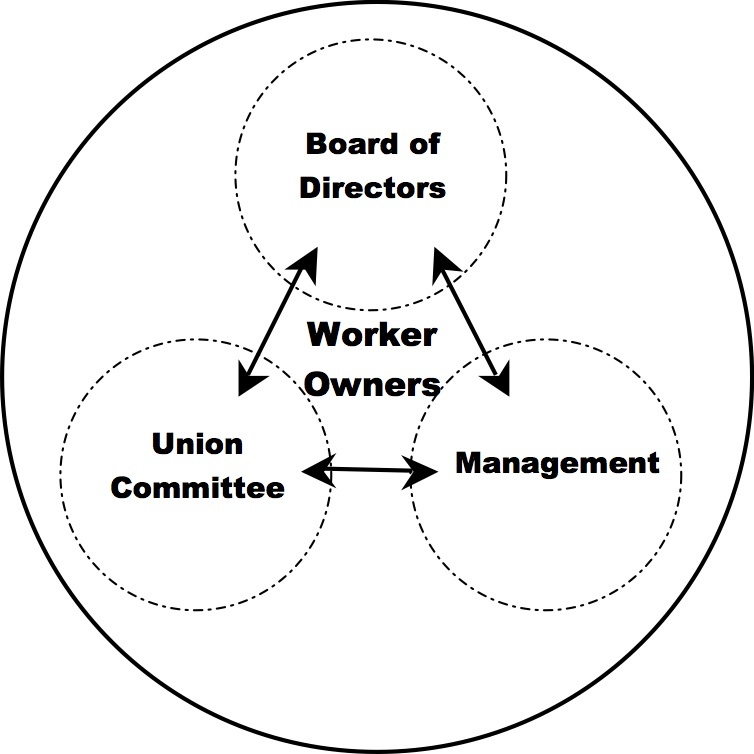 Similar to the Mondragon model, workers in a primary co-operative would have an Annual Meeting (or General Assembly) and would elect a Board of Directors from within the co-op. The Annual Meeting and the election do not necessarily have to be at the same event, one could precede the other. Term of office for Board members and election cycle could either be staggered (such as 2 year terms with half elected each year) or all together (such as 1 year terms with all members elected each year). Composition of Board seats could be a mix of “at-large” seats and representational seats. The elected Board of Directors would appoint Management positions. Management would be appointed from within the co-op. In the Mondragon model, management are appointed for 4 year terms, but cannot serve more than 2 consecutive terms. In the majority of cases, managers are promoted or reassigned before their 8 years are up, but sometimes are returned to the production floor. A provision for a “recall” vote by the workers may increase accountability, although would also require a high enough bar so as not to constantly destabilize management of the co-op. A Union Committee would be elected on a representative basis by non-Management workers. Similar to a Social Council in the Mondragon model, except that the Union Committee would have the power to negotiate with Management over wages, benefits, hours, and working conditions. In contrast, Mondragon’s Social Councils have no official power other than to advise Management. Even in worker-owned cooperatives, it has become accepted practice to elect a Board of Directors and/or Management to run the day-to-day business of the cooperative and look out for the best interests of the business. Similarly, a Union Committee assumes the role of looking out for the best interests of the workers and ensures the fair treatment of workers on a day-to-day basis. A worker would not serve on the Board or Management at the same time as they are serving on the Union Committee. In addition to negotiating a collective bargaining agreement with Management and/or the Board, the Union Committee would work closely with Management to adapt to changes in the business and/or the operation (such as partnership meetings / continuous bargaining). A collective bargaining agreement (CBA) would be negotiated between the Union Committee and Management and/or the Board. The general purpose of the CBA is to establish a set of guidelines for wages, benefits, hours and working conditions that balances the interests of the cooperative as a business with the interests of the worker-owners as workers. In addition to establishing these agreed-upon guidelines, the CBA provides a system of due process (a grievance procedure) if the guidelines are not followed. A democratic workplace may be the ideal, but at times those in the minority need to be protected from those in the majority. The CBA provides more stability and more clarity, both in terms of policy as well as wages and benefits. The Union Committee and Management (and/or the Board) would have the ability to modify the CBA during the term of the Agreement, where both parties agree. Initially, a worker-owned cooperative is unlikely to be able to generate enough of its own capital to convert an existing manufacturing business or to start a new one. Instead of diluting ownership of the primary cooperative, it would make more sense to form a 100% worker-owned cooperative (“one worker, one vote”) that initially takes an ownership stake in the business, bringing on joint venture partners, minority investors, possibly even institutional stakeholders. For example, a 100% worker-owned cooperative may only be able to raise 30% of the capital needed (via investments and/or concessions) to acquire the business, but may be able to attract a variety of 10% to 20% minority investors or non-profit/foundation stakeholders to close the gap. Similar to the use of ESOPs, it could also be a way for the existing ownership to draw down its ownership share over time. The 100% worker-owned co-op that owns 30% of the business can use profits from that 30% ownership to buy out the other stakeholders over time. The co-op would need enough percentage ownership, plus enough friendly stakeholders, to assume management of the operation. The most advantageous ownership structure would allow for a wide variety of investors, but not so fragmented that it becomes unwieldy. Putting together the pieces of the finance/ownership puzzle could include: primary worker-owned co-op, affiliated co-ops, convertible debt, minority investors, non-profits/foundations, anchor institutions, community groups, community banks and/or credit unions? Also potential for grants and tax incentives from local, state, and federal governments. Co-op members could be paid as either worker-owners (wages and profit sharing) or purely as owners (profit advances and profit sharing). Compensation for worker-owners could be very much like traditional employers in most respects: base pay, variable pay, and profit sharing. The major difference in the Mondragon model is the potential for workers to have money withdrawn from their individual profit sharing/ownership accounts. One possible way to make that system more palpable to workers would be to establish a 2 step system where profits first go into a pooled profit sharing account, then eventually overflow into individual accounts – that way if money must be withdrawn from such accounts to cover losses, a pooled reserve maybe able to fill the gap without tapping individual accounts. The tax implications for both the co-op as a whole (a higher proportion of compensation paid as profit sharing would seem to invoke a higher tax paid on “profits”), and for the individual worker-owners (income tax v. capital gains) would need to be considered as well. Worker-owners would contribute Union dues much like any other Union member. (USW dues are primarily calculated as a percent of earnings, including profit sharing payments.) Only if co-op members were to be paid exclusively as owners, some variation or exception may need to be made on the cents per hour worked portion and/or the formulation of the monthly cap. According to Ken Meter’s 2011 report, Ohio’s Food Systems– Farms at the Heart of it All, Ohio is a national leader in local food production in that direct sales from farmers to consumers has shown an increase of 70% from 1992 to 2007, or 5% per year, for a total of $54 million, making up .8% of the commodity market, which is more than twice the national average. However, despite these leaps in local food production, of the $29 billion that Ohio consumers spend on food a year, only $3 billion of it is spent on food that is produced within the state. Another study has shown that in northeast Ohio, a shift of only 25% to local foods could create 27,664 new jobs, providing work for about 1 in 8 unemployed residents. So what is the problem? Why can’t we capture some of these dollars that are being spent on food and create much needed local jobs when we have one of the quickest redevelopments of our local foods system in the country? Meter and the USDA has identified the issue as “a disconnect between producers and consumers”. So what does the USDA recommend? They say that “The answer lies in a new kind of business model known as food hubs, which are is “a centrally located facility with a business management structure facilitating the aggregation, storage, processing, distribution, and/or marketing of locally/regionally produced food”. According to the USDA, food hubs are “emerging as critical ingredients in building stronger regional and local food systems” and this is what we are building in SW Ohio. Vision: Serve the institutions interested in buying local food and improve our regional food system by developing a packaging/processing/distribution facility for food grown within a 150 mile radius. Develop an incubator farm to produce for the food hub as well as train and increase the number of local farmers using the Ohio Cooperative Development Center’s (OCDC) already developed Incubator Farm/Apprenticeship Farmer Training Program. Provide a retail outlet with a commercial kitchen in order to increase the market access of local vendors and a kitchen in order to create value-added products for our customers and catering activities. Ohio State University Agricultural Extension Office, the USDA, Hamilton County Public Health Department –We Thrive, and the Center for Community Change (CCC). 1. Create quality, green, union-cooperative jobs with good wages, healthcare, and retirement plans. * Create better opportunities and stability for local farmers with fair remuneration. * Promote & market the most local, sustainable, fair-trade, organic products feasible. * Cultivate new growers on our incubator farm/apprentice program. * Improve local healthy food access for all Cincinnati Residents. Donations and grants of over $56,000 have been secured towards the completion of a feasibility study and business plan for the entire Food Hub Operations. Feasibility Study in process: Since Dec 2012 OCDC, OSU Extension, and UFCW have been working together on the overall food hub feasibility study. OSU’s feasibility study/business plan for Incubator Farm/Farmer Apprenticeship Program has been complete since Fall 2011 and is being applied to potential farm site in Cincinnati. 30 acre Incubator Farm inside Cincinnati city limits secured: Dale Bahr, a 3rd generation farmer w/ 60+ years of experience, has agreed to lease 7+ acres of his land to the coop this year and as soon as 2013, sell his 30 acre produce farm to the Food Hub. He has also agreed to pass on his current customers to the food hub. Additional 3.5 acres of organic farm land & Classroom location is secured: in Wooden Shoe Hollow located 3 minutes from Dale’s farm, could be utilized for some high value crops. Wooden Shoe also has an amazing building right on the land that can be utilized as classroom space for the apprentices. Secured Buyers for 2012: Central Marketing Associates, Country Fresh, Jungle Jim’s, Pipkins, 400+ direct buyers, and CSA shares to sell all the local produce we can produce.
? Local Market with Commercial Kitchen: a retail store on food hub premises selling as much locally produced food as possible with the facilities to process the local foods creating value added products for the institutional buyers, the store, and for catering events. B. Terms Requested: low interest, pay off 45% of the loan in yr 1, 55% in yr 2 etc. Is the feasibility study complete?